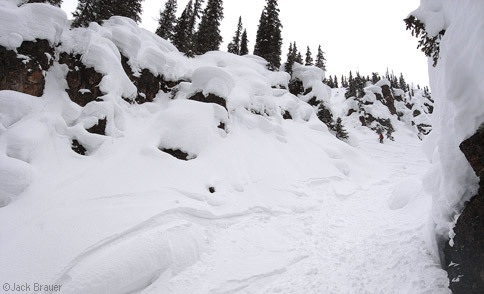 I rode up and down the sides like a giant halfpipe, but at the height of each turn on the walls I’d drop back down off a bunch of pillows, and repeat, and repeat… I could even carry some speed on the wall and launch sideways mid-carve across the pillows like a big horizontal slashing pillow carve. For those of you who don’t know what the hell I’m talking about… well it was awesome. By the way, if you want to know where this run is, I’ll give you a hint: It’s in Colorado. 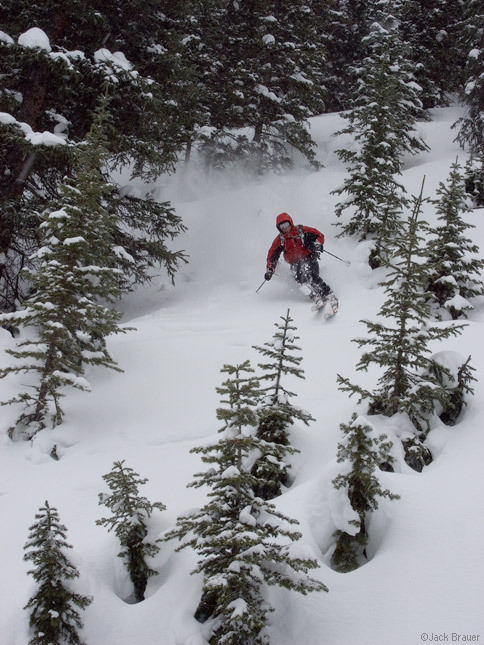 Skier Jeff Skoloda hauls through the trees on the way into the gully. ← Previous: "Out of Ophirica"
Marshmallow pillow drops are the best!